Summer is almost here and what better way to celebrate then by having a BBQ with family and friends? This fun recipe case is a great way to share your favorite tastes of the season. The project can also be used for other themes, as well. Just switch up the paper and stamps. It also makes for a really fun class or stamp club idea. 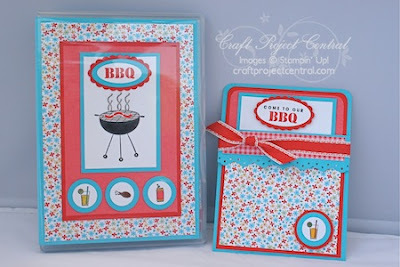 This project also includes instructions for an invitation to the BBQ along with five recipes for the party! This fun project and family recipes designed by Anne Marie! To get the instructions for Anne Marie’s project, just subscribe to May over at Craft Project Central. Saturday. I made these flower hair clips for my daughters. They loved it so much. I made four of these and gave one to my niece. The colour didn't go with her dress that day but I'm sure she can wear it another time. I punched two holes at the bottom of the Two Tags Die and slip the flower through the holes. I stamped the background with the Elements of Style set in Chocolate Chip ink. I added ribbon at the top and tie it with Linen Thread to make it pretty. Need a quick gift for a teacher or co-worker? These cute Post-it Note holders and matching cards are quick and easy to whip up for those last minute gifts. Post-it Note holders are also popular craft fair items! This cute project designed by Jill! To get the instructions for Jill’s Post-it Note project, just subscribe to May over at Craft Project Central. 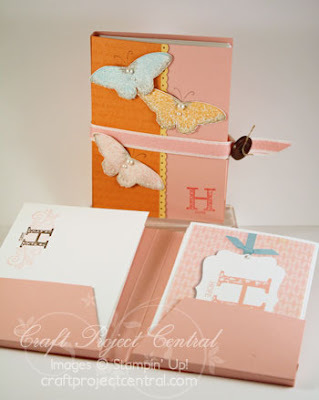 Here is a great stationery box that is fun, as well as quick and easy to make! 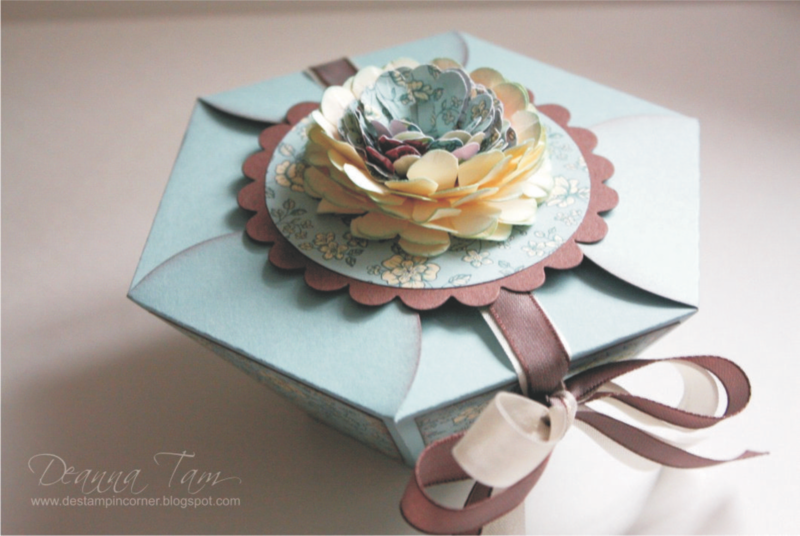 Make this stationery box and card set for that special teacher, co-worker, friend, or yourself!! Also makes for a fun class project! 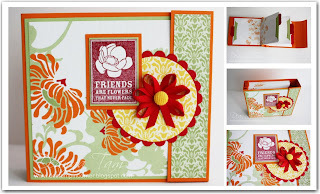 This pretty postage project designed by Tammy! To get the instructions for Tammy’s project, just subscribe to May over at Craft Project Central. Hi stampers! Happy Thursday! I can't believe is Thursday already. Where have my week gone to? I made these favour boxes for the Master Clubs kids. Last Wednesday was the last day of Master Clubs and we had a party. The kids all loved the boxes. I made these boxes from the Petal Cone Die. I made the boxes according to the colours of the club logo. The boxes were filled with lots of candies and a toy. The kids were crazy over the toy. It was a sticky lizard or a sticky frog that they get. They throw the lizard or frog at the wall and it'll stick on it. A few younger ones doesn't know how to do it so theirs got very dirty collecting dust on the floor. The good thing about these sticky toys is you can wash them and they are good as new. This handsome cologne box and matching card are perfect for the amazing dad in your life this coming Father’s Day! This is a quick and easy project that you can even have the kids help you with! After Father’s Day, change up the theme and use the box template for other gift giving occasions! This great Father’s Day gift project comes to you designed by Joanna! To get the instructions for Joanna’s fabulous Father’s Day project, just subscribe to May over at Craft Project Central. Are you looking for a pretty little end of the year gift for that special teacher? How about a little gift for a co-worker or the kids’ grandparents? 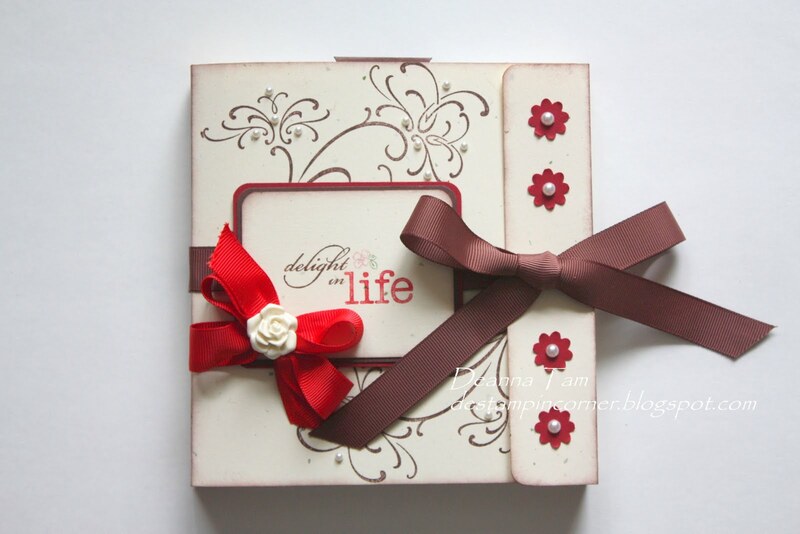 This pretty little scallop circle keepsake box is a wonderful gift to give with the little mini companion album inside! Or put other little treats inside like a gift card, jewelry, etc.! This pretty little project designed by me. 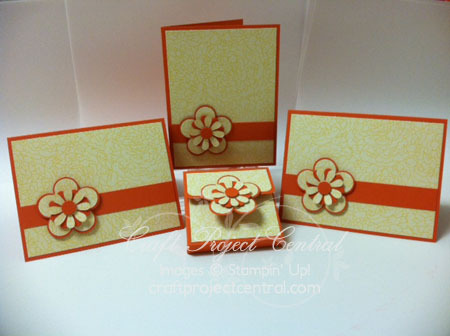 I made a similar project back in 2008 and entered it into Stampin'Up! contest and won. This newer version above looks a lot better. You can view the older version here. To get the instructions for this project, just subscribe to May over at Craft Project Central. Hello everyone! Happy Friday! Hope you're having a wonderful day! I sure am having a wonderful day with the beautiful sunshine outside. Might go for a walk by the Fraser River. Here is an album I made for DH's cousin for her bridal shower. You can get the tutorial here. I made this before I made the tutorial. A different version of the cover of the album. I added ribbon to close the album instead. There is no designer papers on this album. I stamped the cover and a couple of the envelopes inside. Wish I had stamped every single one of the envelopes. It'll make the album looks better. Lots of pearls on this album. Love those self adhesive pearls. They are so pretty! Thank you for stopping by today! Have a wonderful long weekend if you live in BC! Happy Thursday everyone! What a beautiful sunny day today is! The sun makes me happy. Here is the last card of The Open Sea card set. Here is the group picture of the set. I can't seem to pick which one I like best. Now I need to think of how to package this set. I love all of them. This set makes a great Father's Day gift. Have any of you make a Father's Day gift yet? I'm not sure what to give to my husband this year for Father's Day. I'll ask my kids. Thank you for visiting me today! Have good day! 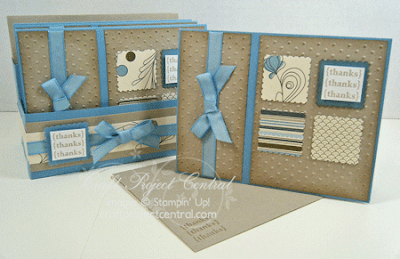 Here are two more cards using the The Open Sea stamp set. I have one more to show you with a group picture of the cards which will be in the next post. 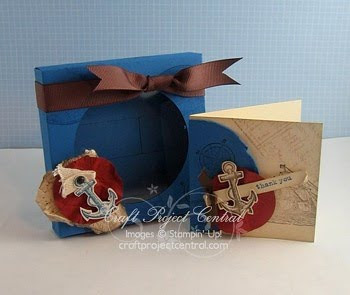 I use the Nautical Expedition Designer Series Paper from the Summer mini for the background. This paper is so pretty. I had a hard time using cause I love it so much and didn't want to cut into it. Well, it is a beautiful sunny day today so I'll be outside most of the time. Spending time with my little one. Thank you for visiting me today! Enjoy your day! Check this out! In honor of National Scrapbooking Month, here is a bonus project for this month is a really neat Scrapbook in a Box! Lift the handle on the box and you have a 6" x 6" album tucked away inside! This is a perfect Mother’s Day gift, or you could even make it up as a special teacher appreciation gift for the end of the school year (which I think for a lot of kids is coming up soon!). Whoever you give this pretty gift to is sure to love it! Makes for a fun class project as well! This great project comes to you from Sharon, one of our new, and very talented guest designers this month! This beautiful album has 10 pages for you to put pictures in. Make one for yourself and make many to give away as gifts. Your friends and family will sure love to receive one of this fabulous album to display in their homes. This tutorial comes with easy step-by-step photo instructions to guide you through. Included in the tutorial are instructions on how to make the ribbon flower. Happy Friday everyone! Beautiful sunny day today here in Vancouver. This post was supposed to be on Thursday but I couldn't post it all day yesterday. Glad the problem is over. 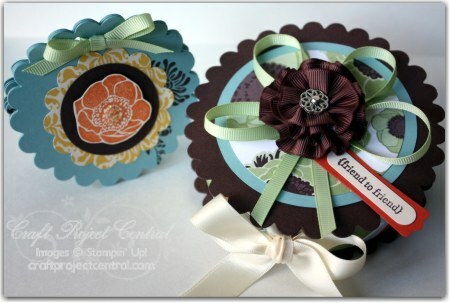 So here is a tutorial on how to make a scallop circle easel card. 1.Die cut a 5" x 10" card stock with the Scallop Circle Die (this die is about 4-1/2" in diameter) and the Big Shot Cutting Machine as shown in picture above. 2.This is how it should look like after the card stock is die cute. 3.Open the scallop circle up, put it into the paper trimmer. Count 16 scallops (the picture showed only 14 scallops, I didn't want to retake the picture) on the circle, making sure to line up the folded part of the scallop circle and score. You should score the valley part of the scallop. 4.Use a Bone Folder to sharpen the score line. Add adhesive to half of the scored scallop circle. 5.Die cut another scallop circle, line up the scallops on the circle and adhere it onto the scored circle. Decorate the scallop circle. Here is my version of the card. Hope you like this little tutorial of the scallop circle easel card. Let me know if you have any question. ETA: sorry if you receive this again in your email. Blogger was having problem for 2 days and they erase this post. I have to re-post it. Hello, everyone! 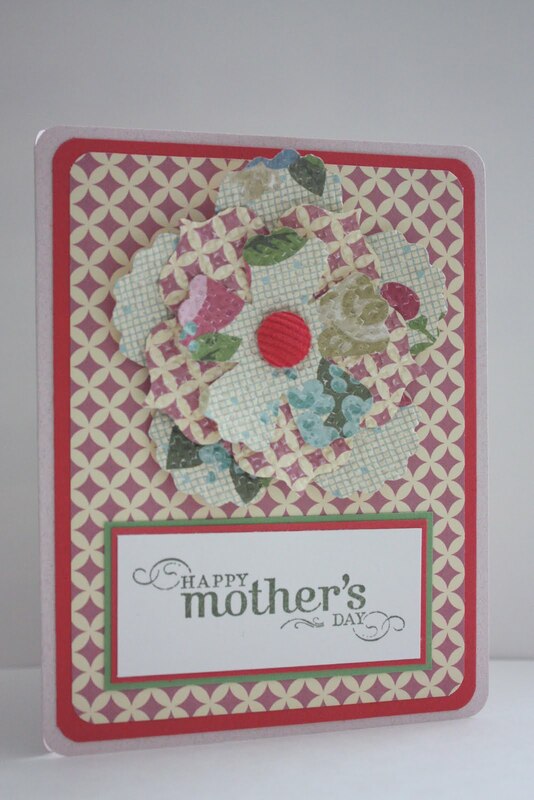 Here is a card I made using The Open Sea stamp set from the Summer mini catalogue. This is an awesome set! When I saw this set it reminds me of a song about a ship called Bluenose. This ship is on our Canadian dime. I went onto youtube and found the song I sang when I was in elementary school. I'm so happy that it was on youtube. I made a set of cards with the The Open Sea stamp set. This will make a great gift for Father's Day. I'll show this one for now. The weather was gloomy so therefor the pictures didn't turn out too good. I use natural light that comes through my window to take all my pictures. This isn’t your usual Post-it Notes cover! This Post-it Note book loos and feels like a book with a hard cover and a fabric-looking binding! 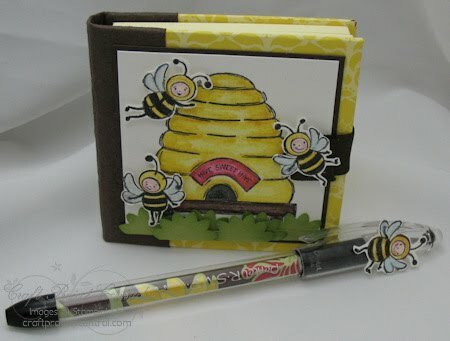 the magnetic closure with floating bee completes the project perfectly! This cute little project with matching pen is a perfect teacher gift and is a fun class or club project! This fun project is designed by Kim! To get the instructions for this project, just subscribe to May and please leave Kim a comment on her cute and fun project! Are you getting married soon or know someone that is? This great projects includes instructions for a Save the Date card, Invitation, RSVP card, Directions inserts, and Guest Book pages! This project and the templates can easily be changed for other party themes like birthdays, showers, etc.! This great project comes to you designed by Sonya! To get the instructions and templates for this project, just subscribe to May on Craft Project Central! Hello everyone! 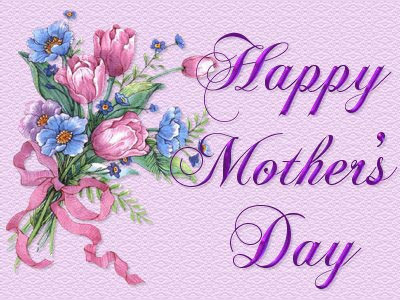 Just want to wish each and everyone a Happy Mother's Day! Wish you the best day ever! Happy Friday everyone! Here are two Mother's Day cards. They are really simple ones. I didn't realize that these cards colours look like Christmas colours until I took a picture of them. Oh, well! At least I finished them and I'll be giving one to my mom tonight. We're celebrating Mother's Day over at my sister's house tonight. Thank you stopping by! Have a wonderful weekend! Hi, everyone! I can't believe this weekend is Mother's Day already. Yikes! 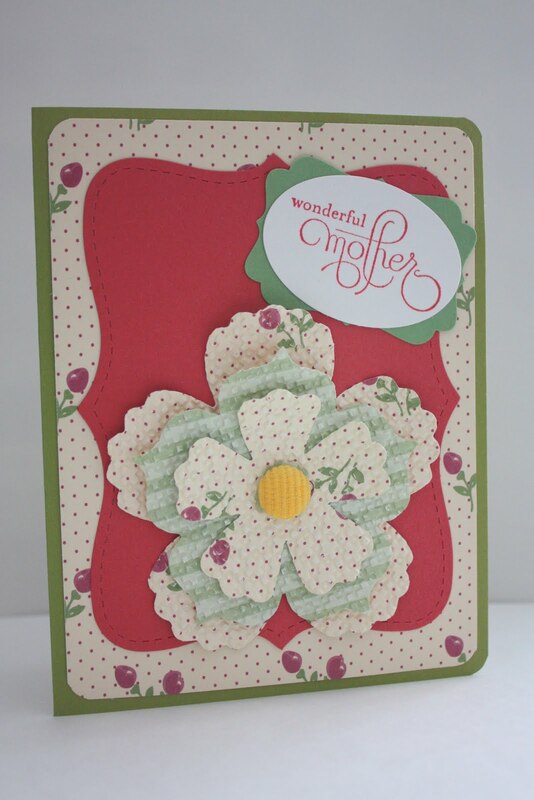 I have not make any Mother's Day card at all this year. Didn't make any to post on my blog either. Will have to make a couple to give to my mom and MIL. Anyway, I have a giveaway for you. You know that I'm a guest designer for Craft Project Central and as a designer I get to give away 1 FREE PASS to their site for the month of May to one lucky winner. Just in time for Mother's Day. Leave a comment on this post telling me any Mother's Day memory you like to share or just comment is fine and I'll pick a winner on Sunday, May 8. Here's my Mother's Day memory I like to share with you. It was 12 years ago on Mother's Day my husband, my friends and I went to the Keg restaurant to have lunch on Sunday. Don't remember why we went to the Keg for. They had a Mother's Day steak dinner special. I rarely eat steak. I like it well done and most of the time when steak is well done they are tough to eat. Anyway, I ordered it but I was not a mother yet. Feel kind of silly in a way. My friends made fun of me but I didn't care because the steak was surprisingly good and tender. I love it! Still I don't eat a lot of steak due to my grinding of teeth. Hard for me to chew on beef. Little did I know on that day I was already pregnant. God has blessed me with a baby and I didn't find out until a week later. What a wonderful gift! 9 month's later my son was born. Wow! He'll be a teenager next year. Time sure flies. I can't wait to hear what great Mother's Day memory you all have. Happy Tuesday everyone! 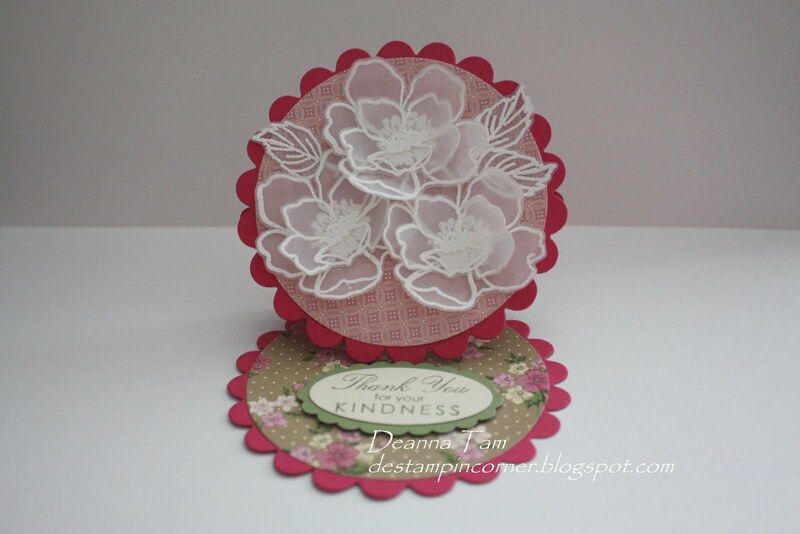 Here is a scallop circle easel card made using the Fabulous Florets stamp set. 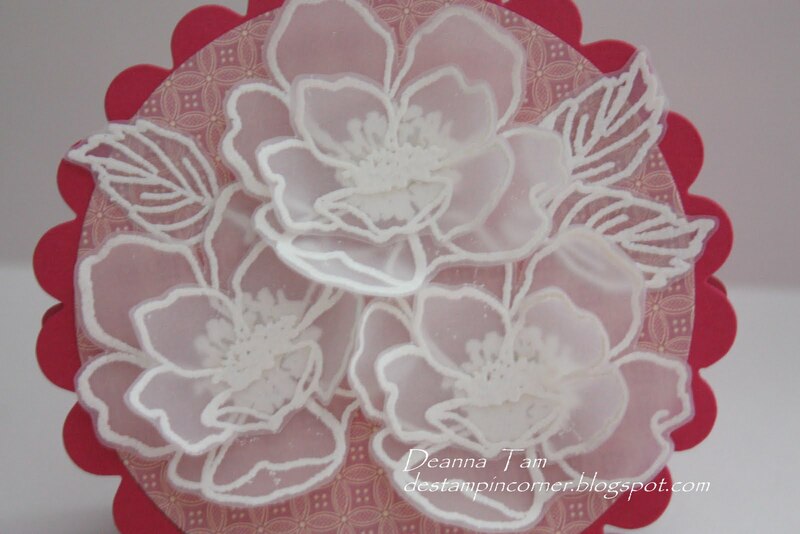 I stamped the flowers on Vellum and embossed it with White Embossing powder. Cut them out and attached them onto the card. The rest of the card is pretty much self explanatory. Happy Monday everyone! Hope you all had a wonderful weekend. I ended up going out on Saturday so I didn't create any cards. But here is one I made on Friday while I watched the Royal Wedding of Kate and Will. No! I did not stayed up for the wedding. Thank goodness there was PVR. Love everything about that wedding although it was a long one. Her dress was so pretty and she was pretty in it. 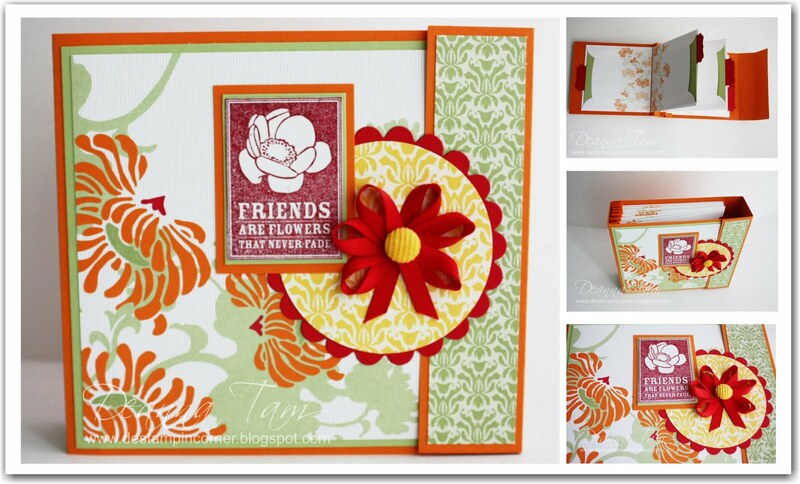 I made this card with the new stamp Sail Away from the Summer Mini. The background paper is the Nautical Expedition Designer Series Paper. Love this paper! I love the samples that are in the catalogue featuring the paper. Thank you for visiting me today! Have a great day! I'm so excited! 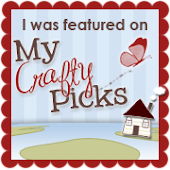 I was asked by Jacque over at Craft Project Central to be a guest designer for the month of May. I can't wait to show you the project I made and the projects made from other fabulous designers of Craft Project Central through the month of May. Here is the first project that starts off the month of May. This beautiful note card portfolio is great to have on hand for quick notes and it also makes a good gift for someone whose life has been touched by Breast Cancer. Best of all, when you purchase the stamp set used to create this portfolio you’ll be contributing to a FABULOUS cause, the Breast Cancer Research Foundation. This fabulous project comes to you designed by Julie! To get the instructions for this fabulous project, just subscribe to May! The Stampin' Up! 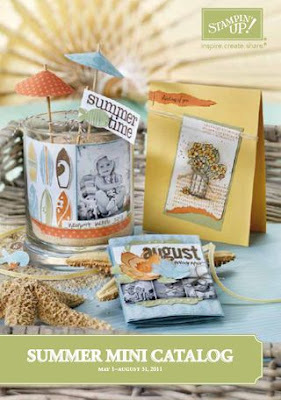 2011 Summer Mini Catalogue is available for ordering today! It's filled with fun new products for summer paper crafting fun! Click here to view the catalogue online.